retrofitted to a fully-fledged e-bike at manageable costs. cars to more resource- and environmentally friendly individual mobility." 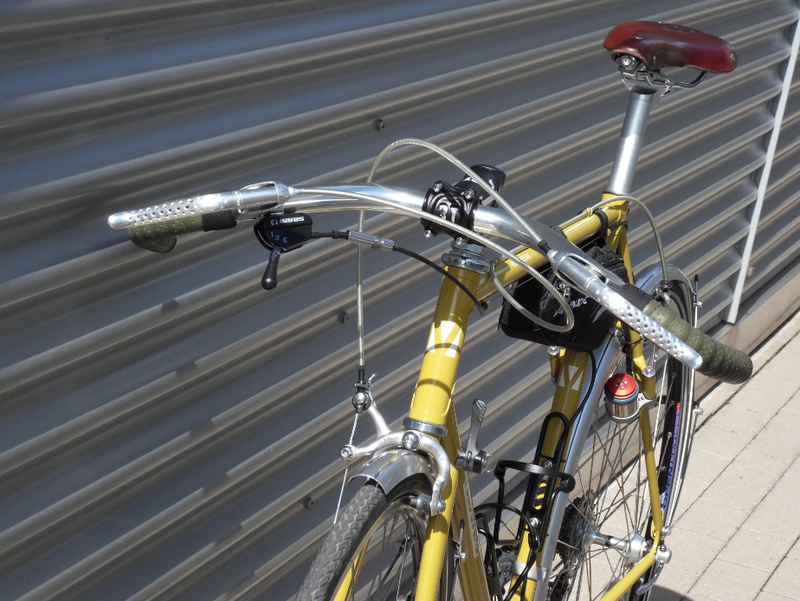 With the VELOSPEEDER customers do not have to choose between classic bicycles or heavy e-bikes. The e-bike remains light and robust at 1/5th of the total weight of conventional pedelec drives. Even an electric bicycle can simply be a bicycle - as if it had always been like that. 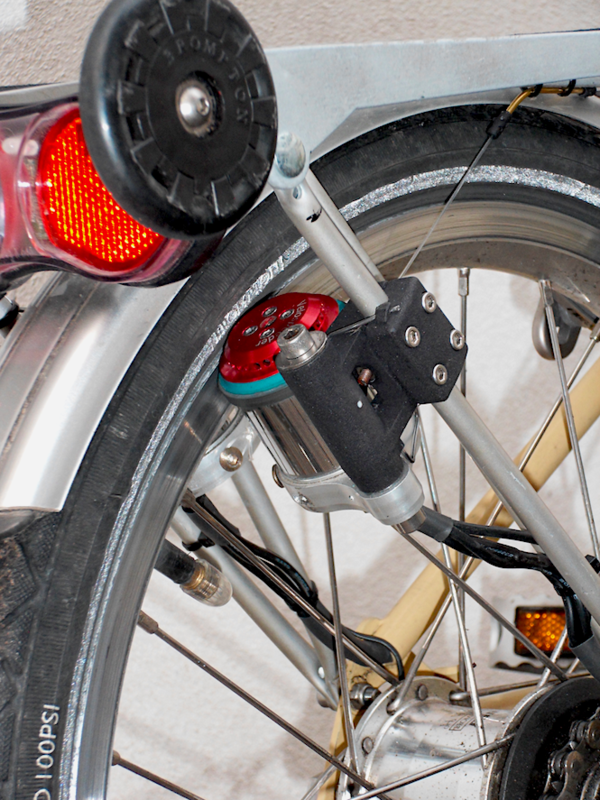 The VELOSPEEDER´s motor weight of roundabout 500 grams enables this light e-Bike drive to become a standard component for normal bicycles - optionally available when necessary. 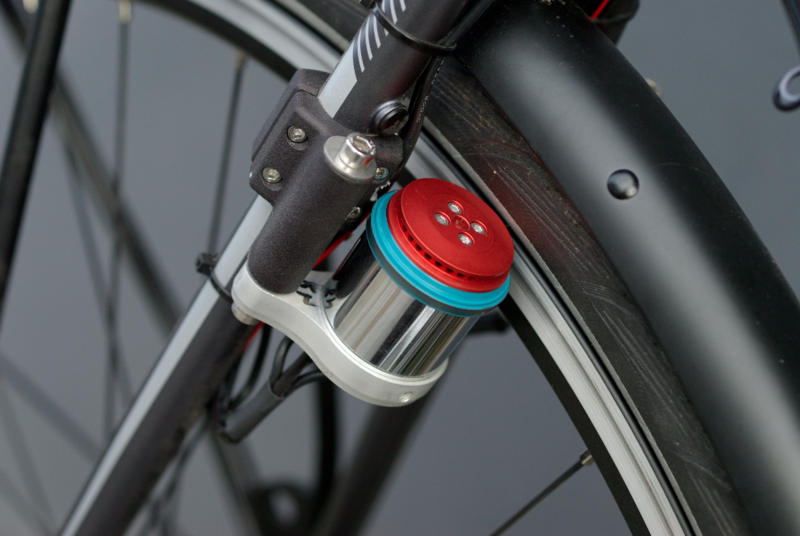 With a good power performance this full e-Bike rim-drive unit with the lowest possible weight increases the radius of action for cyclists, especially for daily cyclists. When not in use the VELOSPEEDER can be folded away completely. The freedom of maintenance with this energy-efficient miniaturized drive for light electric bicycles is extremely high. Only after 7.000-10.000km a replacement of the friction ring is necessary. Apart from the friction ring, the other engine components are largely free from wear. The rolling action of the friction ring on the rim flank is defined in a way, that the lifetime of the wheel is not affected noticeable by use of the friction wheel motor. The parts of the drivetrain are saved at the same time. The VELOSPEEDER works environmentally friendly, 10x more energy-efficient than a moped with combustion engine. 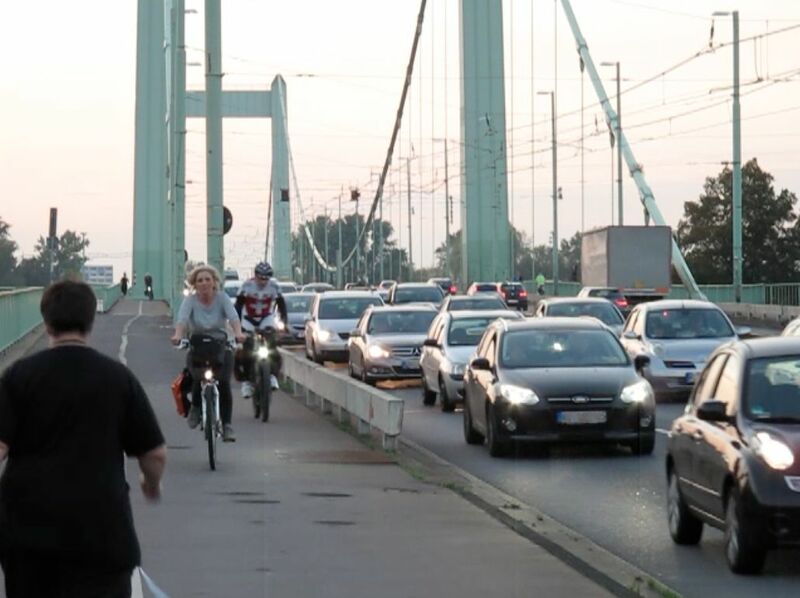 Leaving the traffic jam cycling with the VELOSPEEDER, the GENERATION GREENTECH makes a decision in favor of health and climate. Rim width and axle width are fixed! Find an optimal and repeatable position of the wheel before brazing! 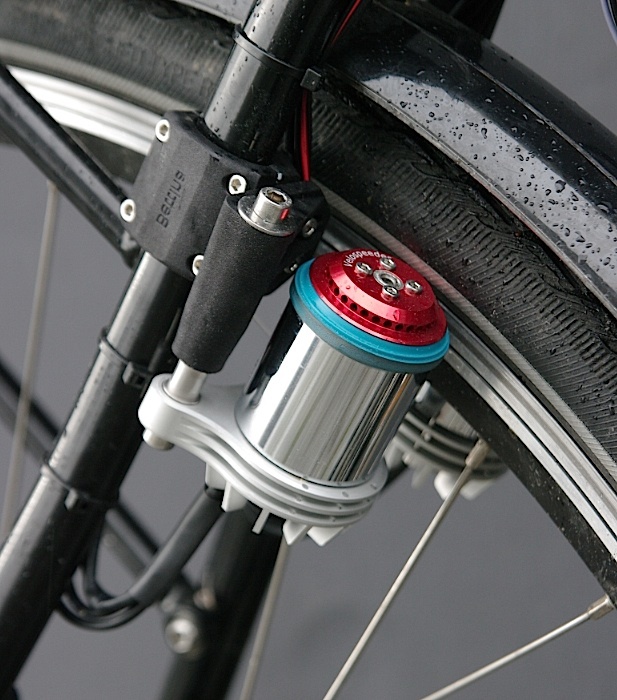 Pedal sensor at the crank set (seat tube mounting) sets the motors in motion. Fine adjustment of the motor parameters at the controller. 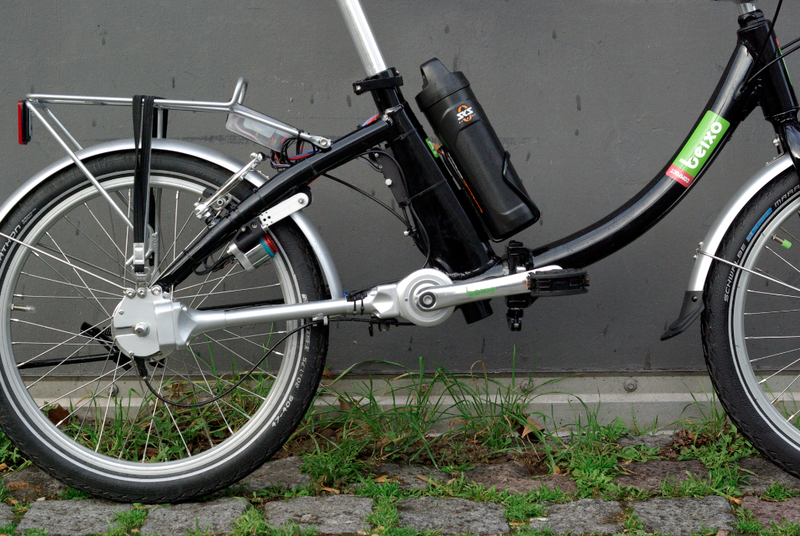 On active demand the Velospeeder can change anytime from the e-Bike mode into the normal bicycle mode via indexed click switch within parts of a second and independently from the pedal sensor. The motors manage WITHOUT any pedal power an incline of 4%-6% (motor type 3025, 3135) at 100kg vehicle total weight. The motors subtract an incline of 4%-6% (motor type 3125, 3135) at 100kg vehicle total weight. 50kg vehicle total weight double the climbing ability. Total weights above 100kg reduce the climbing ability. 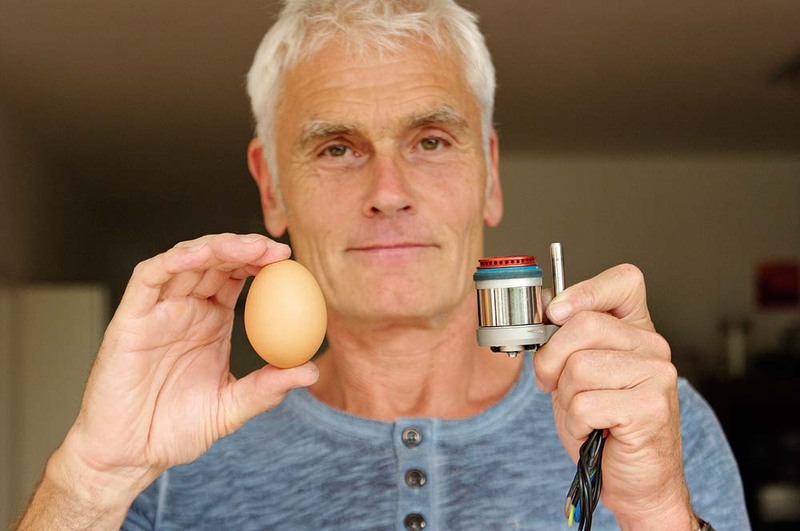 keeping the motor´s rotation speed as high as possible. in accordance with a high engine rotation speed and sporty own contribution during the tour. - Battery ranges differ according factors as pedal power, weight, rolling resistance, terrain conditions, wind, temperarure. - Battery security: standards-compliant we consciously select Li-Ion cells instead of Lithium Polymer cells. on plane, windless test ground (for experimental purposes only). - The mandatory power output of 250 watts for pedelecs is fixed at the controller board and as well fineadjustments of the drive. Customized propietary sine controller extends VELOSPEEDER's range of use. Since 03/2018 we deliver every VELOSPEEDER with sine controller. Existing customers before 03/2018 have the opportunity to retrofit the sine controller. The VELOSPEEDER is a so-called friction drive. Its potential for a "standard motor" among e-Bike drives distinguishes this approach from all current concepts on the market. Two small electric motors, arranged on the left and right side of the rear wheel, wedge at the rim flanks when the motors get started and drive the wheel foreward. 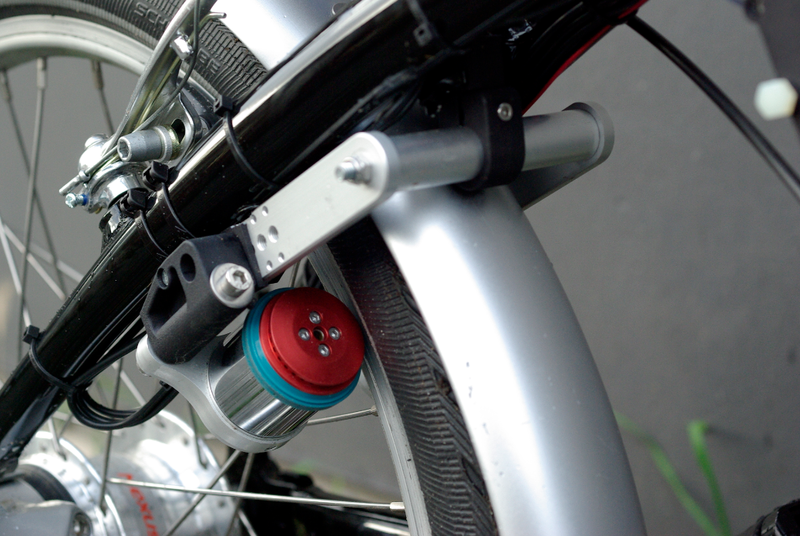 The VELOSPEEDER e-Bike motor is the only friction drive for bicycles with dynamic self-regulation of the contact pressure. At any speed he finds the optimum contact pressure by itself and it doesn´t slip in the wet. The VELOSPEEDER creates its necessary driving forces largely by itself and follows the guiding principle "as much as necessary, as little as possible" - no slipping when starting up (even when wet), no braking effects at higher riding speeds. The trick by which this patented invention is different from all other friction wheel drives in the history of the bicycle, is the geometric arrangement of the swing axle with the engine mount and the solution for the power transmission at the friction wheel. Wheel circumference, rotation speed, thermal management (ventilation, electronics, surface) are further accompanying factors, through which it is possible to build these engines so miniaturized small. The VELOSPEEDER is no new edition of well-known static friction wheel drives. With fundamentally different design, the VELOSPEEDER is the only e-Bike drive of its kind, that compensates successfully the systemic weaknesses of previous friction-wheel drives. 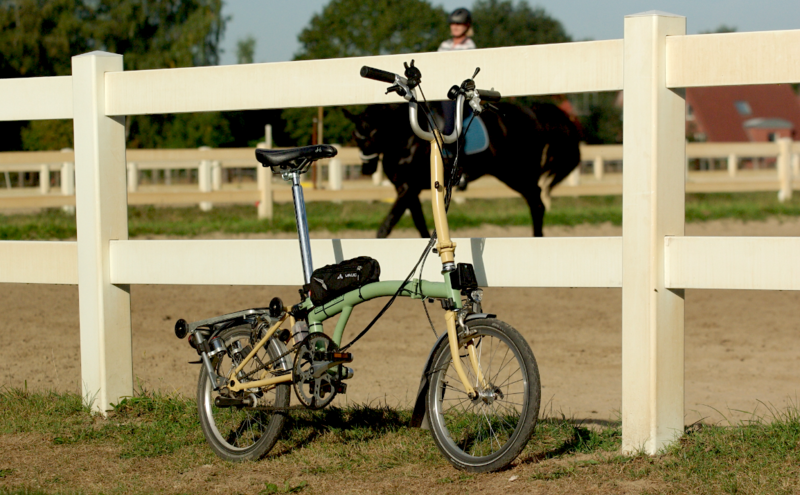 The attractive engine performance of the miniaturized VELOSPEEDER behaves similar to the engine power of established e-Bike drives, especially rear hub motors with defined final rotation speed, but without limitations selecting a type of gear box, racks and mud guards. The VELOSPEEDER standard motor for light pedelecs, light e-bikes is possible by the clever use of physical principles, but at 1/5 of the weight of usual pedelec drives. The maintenance-free interval is indicated between 7.000 and 10.000 kilometers (4350-6210 miles) under mixed terrain conditions. The material properties of the friction rings correspond with hard and smooth-running skateboard wheels made of polyurethane. as with brake pads and surrounding material heating. to make an e-Bike drive invisible. Why was the VELOSPEEDER Developed? VELOGICAL has realized, that the rim flank is useful for more than just braking. The rim flank provides excellent conditions for the transmission of drive forces - highly efficient and on a short route. 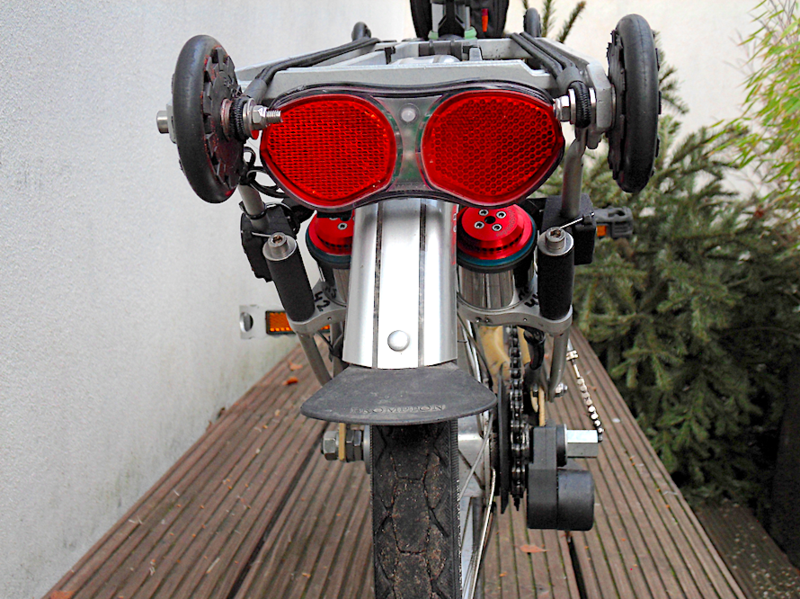 Then we developed the world´s lightest electric drive for bicycles, the VELOSPEEDER. Our principles are based on transforming logical relationships into products - for the benefit of the customers. The VELOGICAL engineering GmbH supplies specialized components for the cycle industry, especially miniaturized drive technology and electrical engineering. 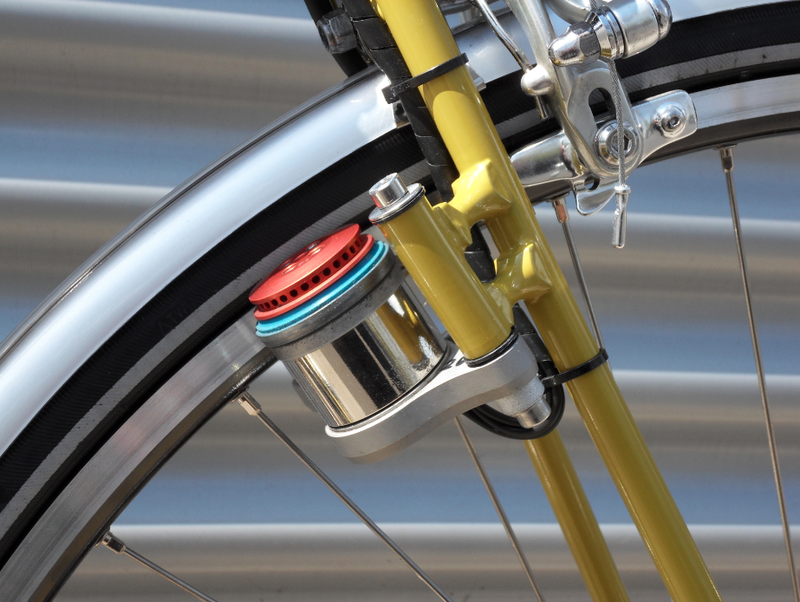 VELOGICAL stands for low rolling resistance, lightweight, efficiency. The existing electric drive solutions for bicycles usually require several preconditions to be met by a manufacturer for the construction. Normal electric drives in every day use on the long run are not durable and not low maintenance components. They are not universally applicable and often they have a high weight. The potential for a "standard motor" has only an overall solution, that hardly requires constructive conditions, that the manufacturer has to fullfill. The approach for a "standard motor" is intended to cover a wide range for everyday use from low maintenance to a minimum of moving parts with a minimum need of raw materials. Lightweight, efficiency, universal applicability and ease to repair - these requirements are met by the VELOSPEEDER. All innovations in bicycle design established since the 1980s fullfilled these guiding principles, says a well-known industry expert. when additional functions are not in use. 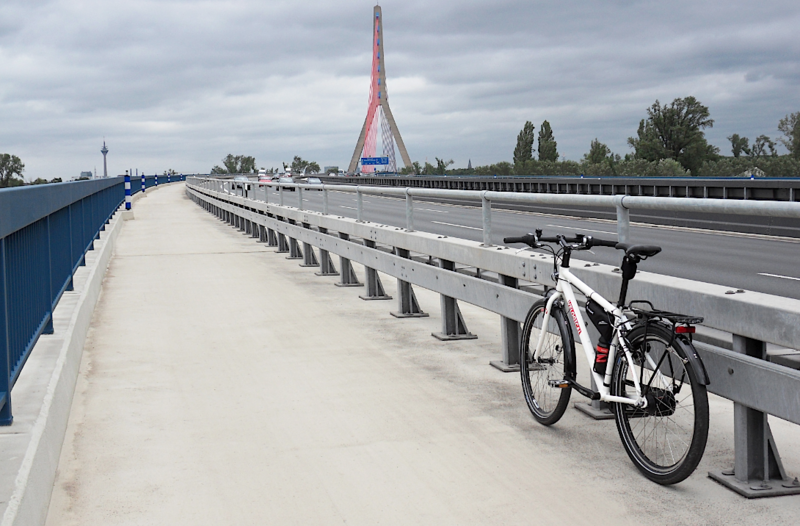 The universal VELOSPEEDER invented by VELOGICAL engineering GmbH has the potential to add a new dimension towards the strong trend of electrification in the bicycle market. in Favor of Health and Climate. "Hello- yes, it works great. A little 'steam punk' , but the functionality is better than any gear drive type system. We have thousands of km on this little bike and anyone who rides it just smiles all the time. Tim"
15.10.2018: "(...) Overall feedback is very positive. The people riding it love the fact that is very quiet and offers just enough assist to 'smooth out' the hills.(...) The bike has very wide gearing - so any grade hill is really no issue. (...)"
"With the new controller you have indeed succeeded in considerable improvements. It has become considerably quieter and practically only the friction noises of the engine can be heard." "You at Velogical just make things possible. Thank you very much for your cooperation." "(...) Already after the test ride I was addicted. Such a smart device making my rides so much easier. Wheras effort stays the same, my reach has doubled. My congratulations again for winning the federal ecodesign award. So proud of you, but also myself for riding a sustainable and award-winning power-unit. Keep on the good work!" "… the Velospeeder arrived yesterday and I mounted it in the evening. Everything went well with the installation and the trip to work and back today was a dream! Thanks for the great product. I am super satisfied so far. :-)"
"I am very satisfied with the Velospeeder. Yesterday I made a 75 km trip using the engines in the hills only and on arrival, the battery was still at 20V. All those who discover it are surprised by the elegance and the technical intelligence of your solution. I arouse a lot of curiosity and make a lot of jealous. "Hi all, I wanted to report an update using the Velogical gen3 velospeeder with low-speed, high-torque firmware. I've gone about 500 km on my Velospeeder-equipped bicycle. This has been mostly on my work commute which is 13 km round trip with 150m elevation gain. The "A" battery pack easily handles 3 round trips, and tends to run out of power halfway through a 4th - for a total range of 45km on 1 charge. This extended range is due to my use of the battery only when uphill grade exceeds 2%. On flats and downhills I can pedal faster than this Velospeeder firmware's top speed. I like the positive reinforcement that I can ride faster than my e-bike motor! This also helps me remember to disengage the motor once the uphill section is leveling out. Going uphill the motor enables me to keep my speed up to 7 km/hr on 7% grades. The Velospeeder motors are quiet. While I can hear them when riding, pedestrians I pass rarely do. It's a little quieter than most e-bikes here in the USA, where 300 watt motors are the smallest available, and most are 750 watts. Installation time seemed a bit high at first, but I was well aware that most of the time was due to my choice to go slow and learn what I was doing as I went. Maintenance time has been very close to nothing, as I've simply wiped it down a bit after riding in the rain or cleaning/oiling my chain. Thanks again for making and promoting this product, and for the engineering that goes into your custom brackets. At 62 years and 80kg, I'm not in great shape but riding my bike more often is certainly helping. I am riding my bike much more than I have in prior years, due to the climbing ease the Velospeeder has given me. ..."
"I have to say I was kind of expectant due to the high verbosity of the instructions. 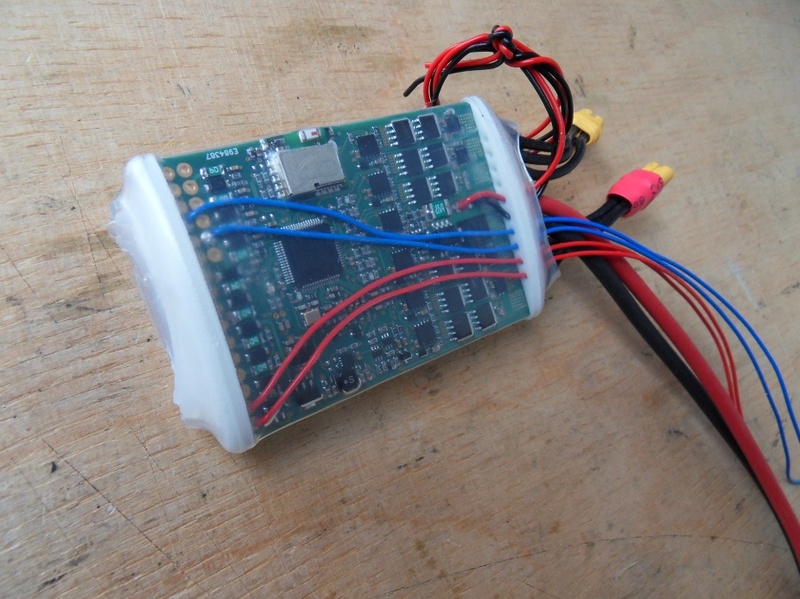 But after starting the assembly, the kit is so well designed it was mostly self explanatory from my previous experience, and the connection diagram. Only the nylon cable adjustment seems to be more complicated, but the instructions solved any doubt I had. It is working perfectly, and I'll do a test run tomorrow before delivering it to the costumer. It is really diy friendly, and the design shows how long you have been developing and refining it." "We have the world's lightest e-bike retrofit system on our editorial board for a year, and since we've done almost all of our ways by bike riding, we've probably gathered 2-3,000km. There were no mechanical or electronic failures. Nevertheless, we have upgraded the electronics for the further developed version. In the previous version you had to turn off the drive unit at traffic lights stops and then start it again. The new electronics are switched on in the morning and off in the evening. The rest is now controlled independently by the electronics. We can certify the system an unrestricted suitability for everyday use and a considerable fun factor. (Rb / MF)"
As well on dirt roads and gravel roads (causing vibrations) I had no problems with the technology. 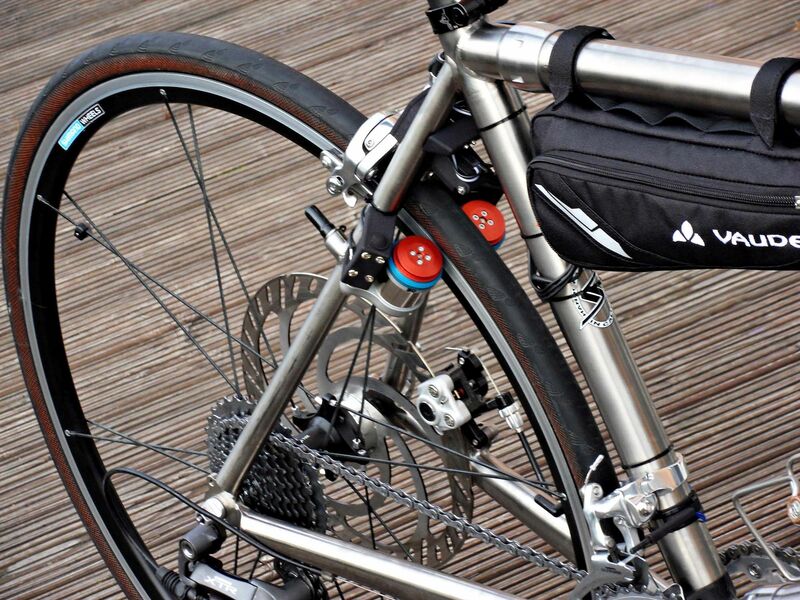 .... "
"The frame-specific motor bracket seems to work well after the first kilometers I traveled. My compliments to Mr. Frieden for the super construction! The motor is a little bit louder than a standard pedelec, but it doesn´t bother me personally. In my opinion it is even an advantage that you can hear, the operating state of the engine. The bike (see attached photo) weighs less than 15,5kg, whereas normal pedelecs in this price range weigh more than 20kg. The Poison Atropine frame with Rohloff gear-hub, hydraulic Magura rim-brakes and the Velospeeder are the perfect combination for me. .... Finally, thank you for your support and good luck with the marketing of the e-bike drive." "I must say, that my expectations were exceeded. It all worked out right away. The performance of the motors on the mountain is good and the battery for me is sufficient. In the plane I do not need the drive and the 300 meters in height were managed as well as the 30 kilometers without any problems. But it I ride a road bike and I myself weigh 75kg and I like pedaling. Your concept is ideal and my road bike I love remains my bike and I hope to be able to use it for a long time despite advancing age. Also in the mountains." "My husband and I, we don´t want to miss our engines any more. The acquisition was the best purchase decision in 2016." "…. I have been riding the Velospeeder with my DahonMy folding bike for a couple of days, and I can verify the experience reports. The folding function remains the same, the weight of the motors, cabling and the controller is 900 gr - about 600 gr. I could save alone by the renouncement of the hub dynamo. Although I did not trust the friction drive with the "first contact" with the system at all, I am convinced after some trips in wetness before and now even more. The contact pressure is retained! The motors run very quietly in their optimal rotation speed, with lower speeds and increasing load, they are clearly, but not dramatically audible. 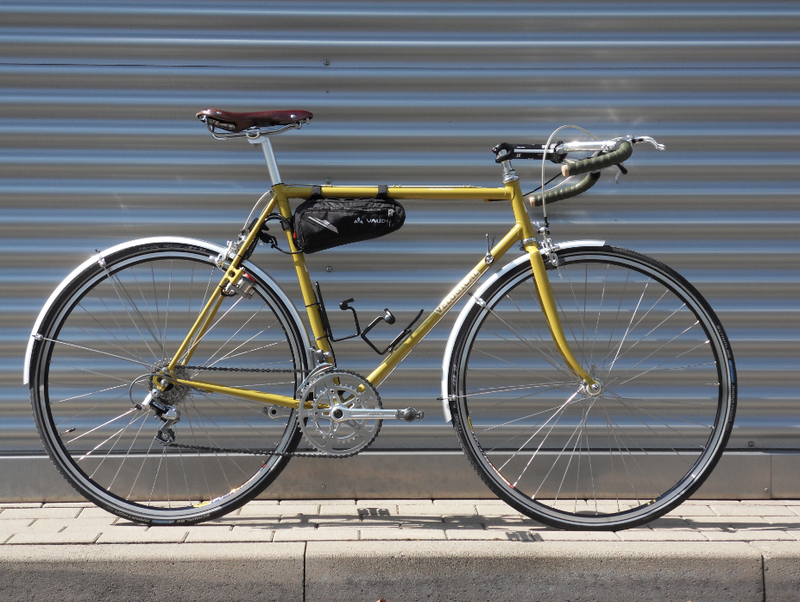 "Almost to the day one year ago I could retrofit my bike with you in Cologne. Have not regretted the conversion. Even after a year there no problems with the conversion." All supplied sets are delivered customized including all necessary parts. Fits in a SKS tool box for bottle holder, in a seat post saddlebag and in all containers for battery pack C.
Fits in a frame triangle bag (e.g. Vaude Cruiser Bag), in rack top bags (e.g. 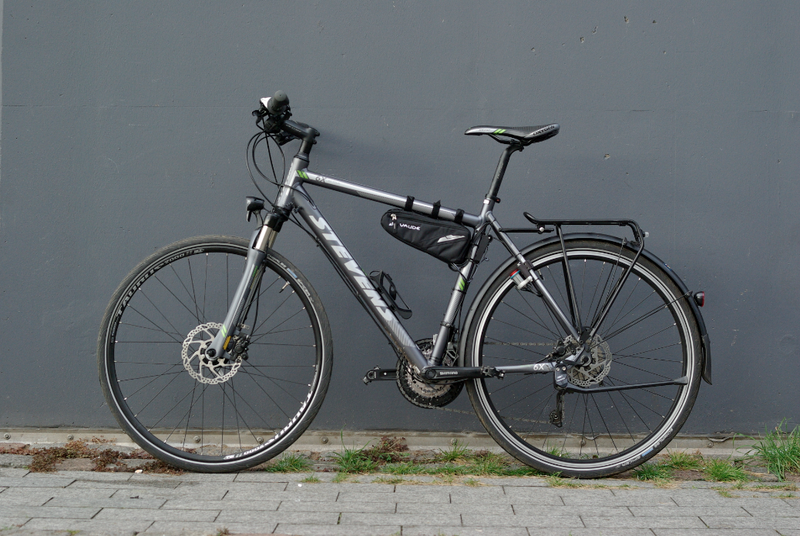 Vaude Silk Road S for narrow sport racks, or e.g. 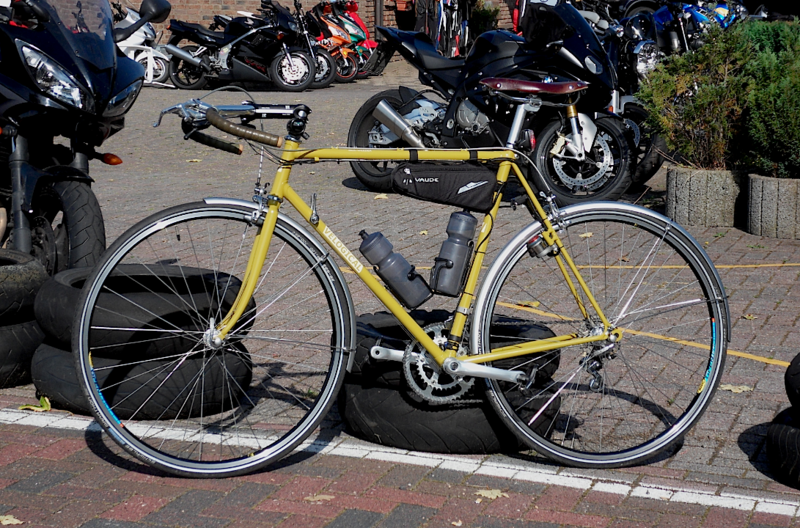 in Vaude Silk Road M with standard top for touring racks. Additional benefits Vaude Silk Road M: storage space for various utensils. 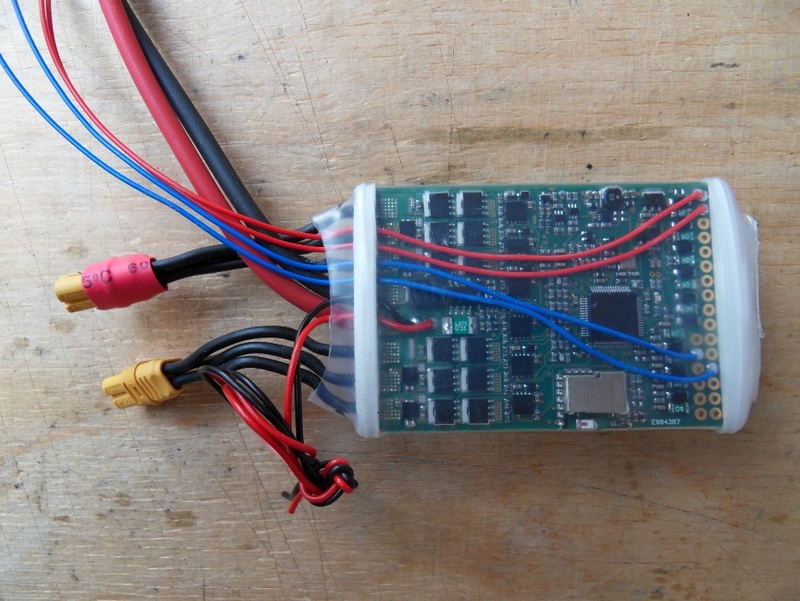 Q) Is it still necessary to disconnect the plug connection to the battery at the sine controller after the end of the journey? A) No, is no longer necessary to unplug the battery after the ride. An inserted battery no longer consumes energy that discharges the battery. The battery plug is only disconnetcted for charging at the socket. 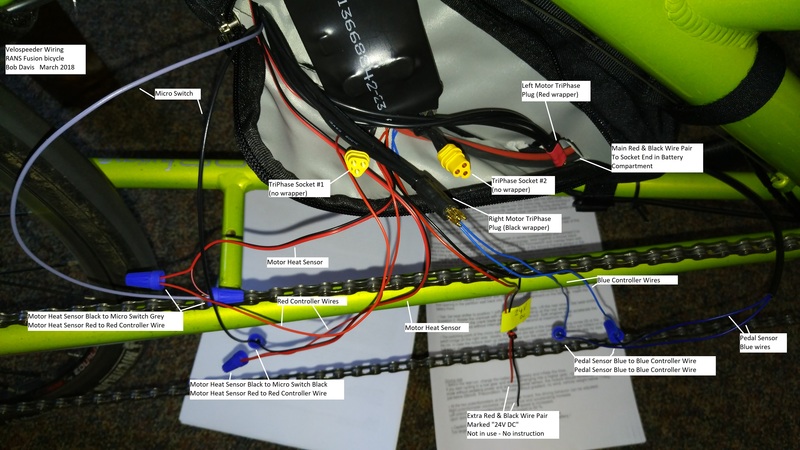 Exception: If an eBike lighting system is connected to the battery, the battery plug must be unplugged from the controller, as most e-bike lighting systems do not have a switch at the headlight. The Velospeeder does not use a display at the handlebar. Q) The left (red) and right (black) triphase plugs from the motors are marked ok. The mating connectors on the controller board are not marked. I call them Socket #1 and Socket #2 in the picture below. Does Left (red) plug into socket #1 and Right (black) plug into socket #2? If I plug them in reversed, will the motors just turn backwards, or will they be damaged? direction of rotation of the motors and drives in the same direction. Therefore it does not matter any more, which motor connector is connected to which controller connector. Q) There is an extra 2-lead wire (1 red lead & 1 black lead) that has a paper tag marked "24V DC". I do not see any instructions for hooking up this wire in the Final Assembly document. Is this the extra wire in case I want to connect the second battery pack? Can I safely leave this wire unused? It's a much smaller gauge than the main battery pack wires. 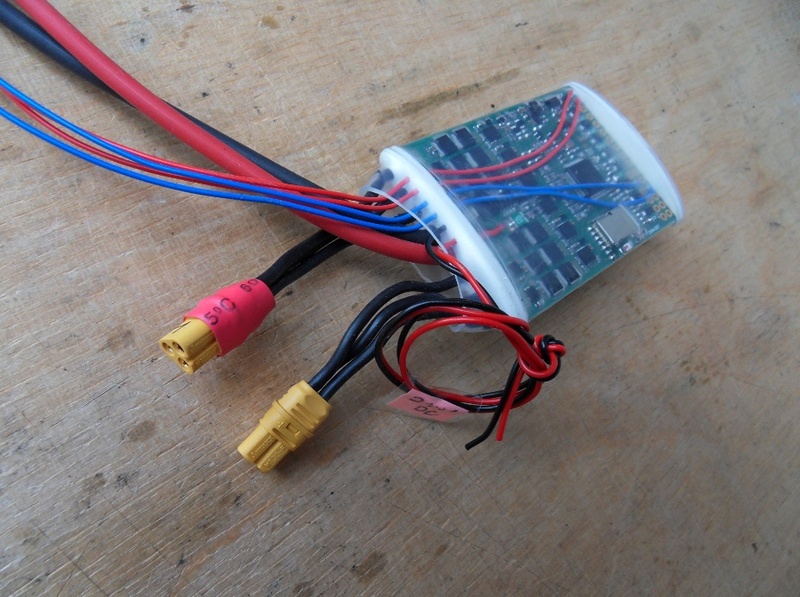 A) the 24V dc interface is an option, e.g. 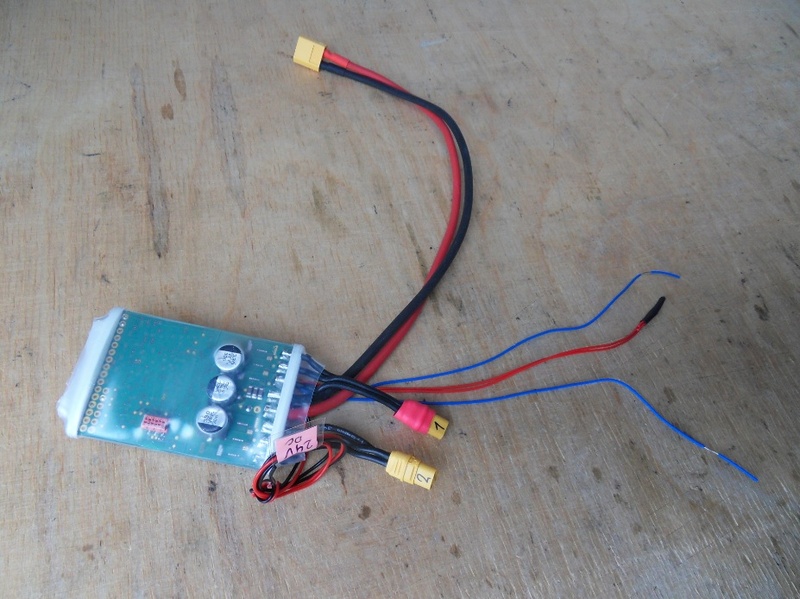 to connect an 6-48V e-bike headlight or a DC-DC_converter (e.g. for mobile phones, GPS-navigation). The interface is short-circuit proof. It can deliver max. 1A and will be when the battery is empty to avoid deep discharge. Surface circuit board between bigger business card and smaller cigarette box. Installation space vertical: height incl. cable bend ca.10cm, width 5cm, depth highest point 1,5cm. Vertical mounting inside compartment Vaude Cruiser frame bag, space requirement approx. 1/3 compartment.